Life is full of stressful situations and it does not stop once you leave work and enter your home. Situations happen that can have many different explanations. Those facing domestic violence charges know this more than anyone, and it is helpful to educate yourself on how to be sure your side of the story is told. Because of the highly emotional and fact-specific nature of cases involving domestic disputes, it is difficult to provide a comprehensive guide without writing a novel; however, knowing a few general defenses can help you avoid criminal liability for an alleged law violation. If a person harms another, but is acting to defend themselves against even greater harm, they are likely acting in self-defense. In Colorado, there are entire cases devoted to the idea of self-defense and may be used as guides as to what is and is not considered to be sufficient to act as a defense for committing what otherwise would be a crime. Police officers are also guided by Colorado law to look for evidence of self-defense when making arrests. For example, one section of Colorado’s statutes explains that an officer who is responding to a domestic violence situation should make a determination as to who is the primary aggressor. In order to make this determination, the officer must look at factors, including the possibility that one of the parties involved acted in self-defense. When presenting a self-defense argument, it should be noted that the defendant is essentially admitting to the alleged assault on the other person. They are merely stating that the assault was warranted to protect themselves from greater injury. In order to successfully argue self-defense, it is important that the defendant gather evidence showing that his or her explanation of the struggle is true — i.e. witness testimony, physical evidence from the scene, evidence of marks to their person. Included in the self-defense principle is the idea of defense of others. It too, can act as a bar to a finding of liability in domestic violence cases. 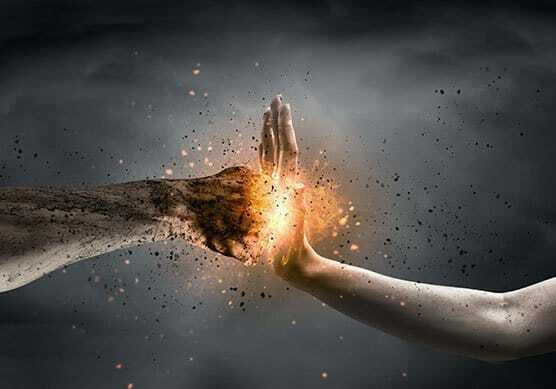 Generally, as in self-defense cases, a person may act in such a way so as to prevent harm to another, even if it means committing an assault on another person. The amount of force used must be reasonable, given the circumstances, and a defendant would need to prove that the level of force used was done so out of necessity. This defense can be similar to an alibi defense. If that is the case, a defendant could raise this defense if he or she was not near the scene of the incident at the time the alleged offense occurred. In domestic violence situations, however, this type of defense may look a bit different, as it is common for a non-guilty party to be at the scene despite not having any involvement in the injury of the victim. For example, if someone is injured during a fight that occurred at a party involving numerous adults in one location, if that person claims that the injury is their spouse’s fault, the police may consider this a domestic violence situation. In defense, the injured party’s spouse could present evidence to show that the person was actually harmed by someone else at the party. If proven, this would help the accused individual avoid liability for something that he or she did not do. It is also unfortunately common in domestic situations for someone to falsely accuse their spouse of domestic violence in order to further their own agenda. This is especially true in divorce or separation proceedings or where child custody matters are at issue. These types of allegations can have serious consequences, and an accused person has the right to provide a defense that includes a showing that the accusing party is being untruthful. In addition to the above referenced defenses, someone who is accused of crimes involving domestic violence may have other justifiable reasons for what they did, including that their actions were justified by necessity or because they were done in defense of property or habitation. The latter is sometimes referred to as the “castle defense” and in Colorado has been expanded to include deadly force with its “make my day” statute. While this may not be considered as often as other defenses in domestic violence situations, it does not mean that the facts of a particular case may not warrant its use. It is important to remember that Colorado law also allows an individual to use reasonable, not deadly, force against another person to defend against damage to his or her property, since domestic disputes can often involve actions against a partner or spouse’s property. Sometimes, the facts of a particular incident are such that they warrant the use of force against another person, even if that person is an intimate partner or spouse. Necessity is a defense that is very similar to self-defense in that it is sometimes necessary to use force in order to prevent the commission of a worse crime. Essentially, if a defendant can show that his or her actions were reasonable under the circumstances, necessity can be a strong defense to those actions. More of a defense strategy than an articulable defense, a defendant in a criminal proceeding, including domestic violence situations, may always present a defense that holds a prosecutor to their burden to prove their case beyond a reasonable doubt. This defense strategy uses faults in the prosecution’s own case to show that the allegations against the defendant cannot be proven beyond a reasonable doubt. If the prosecution does not have sufficient evidence to show that a defendant actually committed the crime he or she is accused of, then the charges will be dismissed. Domestic violence charges take many forms and arise out of an almost infinite combination of facts and events. Because these types of charges arise from so many different fact patterns, proving what happened can be very time intensive and stressful. When facing domestic violence charges, it is important to review all the facts and choose the best defense for your situation in order to avoid a wrongful conviction. Contact my office if you have any questions about domestic violence.